Runoff from mine site, likely an abandoned underground mine, was bright orange and flowing into a larger stream that passes through residential property. 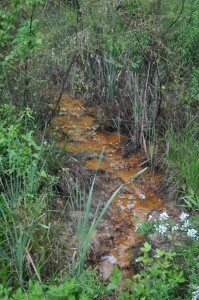 The color, visible in the associated photograph, is indicative of acid mine drainage. The presence of acid mine drainage can be confirmed with the pH reading of 3.2, which is substantially lower than the neutral value of 7.0. The conductivity and dissolved solids readings were both also higher than is typical of central Appalachian streams.